"No One Travels Alone," the brand new studio album from award-winning singer/songwriter Jon Brooks, is now available on Borealis Records. This is the sixth album from the King City-born, Toronto-based folk singer/songwriter, who against all odds and conventional career logic released his debut in 2006 at the age of 37. Over that time, Brooks has toured extensively across Canada, the U.S., Europe and Australia. Brooks holds a record four Canadian Folk Music Award nominations for English Songwriter of the Year and remains only the fourth Canadian since 1975 to win the prestigious Kerrville Folk Festival New Folk Award. Although the album was first written in 2016, Brooks found himself sidelined for a year after suffering an epileptic seizure while driving his car through the U.S. midwest. "I woke up in a Flint emergency ward with both shoulders dislocated, and severe nerve damage to my right leg," Brooks said. Brooks spent months on his couch in a weakened state, unable to lift the smallest of items, much less a guitar. "This inspired the rewriting of about two thirds of the album, which led to a markedly different tone," Brooks said. "It's a much kinder, more sincere — NOT earnest — album. I believe it asks the kinds of childlike, and paradoxically, essential, questions only asked by someone suddenly facing potential permanent loss." "No One Travels Alone's" first single is the Spanish-titled "Todos Caminamos Por Este Caminito," which Brooks describes as: "Underlying this soothing major key groove is a quiet protest at the fact there are 65 million refugees displaced from their lives and home from war and fear." "No One Travels Alone" is a playful and ponderous anti-genre recording that deliberately asks more questions than it attempts to answer, pursuing themes that embody everything from suffering, beauty and humanity, to faith, our digital age, and the vast expanse of our universe. The album also accomplishes something unique in modern songwriting: its tracks are connected by the Elizabethan corona (circular) form, in which the last line of each song doubles as the first line of the following song, until the final song completes a circle, or corona. "The songs become interconnected," Brooks said. "As are we; thus it is: No One Travels Alone." "No One Travels Alone" was recorded in Hamilton, Ontario, and features a stunning album cover created by Canadian music legend Martin Tielli. 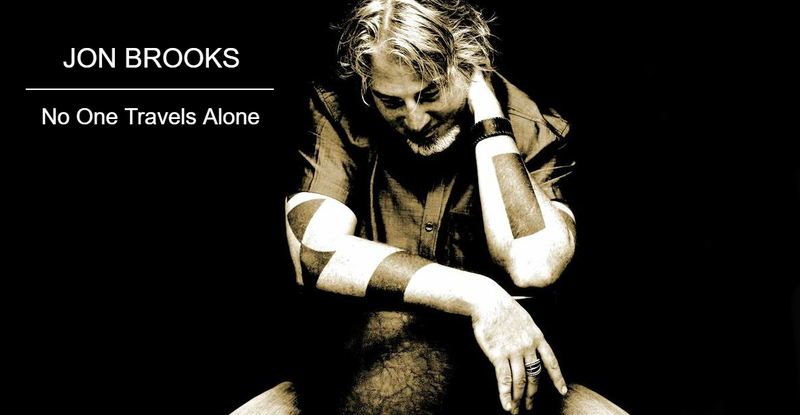 In the wake of his recovery and the album's release, Brooks is lining up a slate of performance dates for the remainder of 2018 and beyond.